Conboy, McKay, Bachman & Kendall, LLP (CMB&K) has served the diverse legal needs of our community since it was founded in 1876. It is located to serve Jefferson, Lewis, St. Lawrence and Franklin Counties, as well as Fort Drum and other communities in the North Country from its ofﬁces in Watertown, Carthage, and Canton. 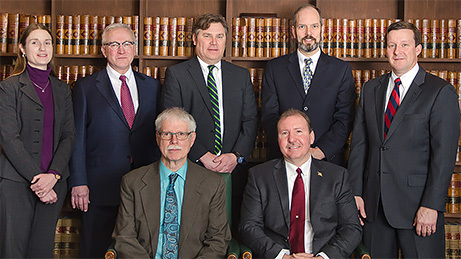 CMB&K assists businesses, individuals, and municipalities with a wide array of legal experience in the areas of personal injury litigation, commercial and civil litigation, estate planning and administration, Social Security, domestic relations, family law, criminal law, banking, municipal, and real estate matters. The ﬁrm emphasizes a personal approach in its relationship with clients. We assign each legal matter to those attorneys whose background and training is best suited to meet the client’s requirements. As necessary, that attorney consults with other attorneys in the ﬁrm to provide a comprehensive service to the client. Our attorneys possess diverse educational backgrounds and outstanding legal training. They regularly appear in Federal and State Courts serving the Counties of Northern New York, as well as in Syracuse and Albany. They serve in many civic and charitable endeavors, including service as members of many local not-for-proﬁt entities. Through the ﬁrm’s legal practice groups, attorneys meet regularly to share education updates and to discuss the best approach to complex problems. In instances when the assigned attorney is not available, another attorney will be able to assist clients in a timely manner.